Today, I’m going to be making, Japanese Melon pan. Melon pan is very popular Japanese traditional sweet bread. The light texture cookie dough is on top of fluffy milk bread. The edges of the cookie crust is so crispy and make this bread so special. Actually, Melon pan has nothing to do with Melon. The criss-cross pattern on the surface looks like a melon. In Kansai include Osaka, sometimes it is called “Sunrise”. Because it looks like the sun! If you have ever come to Japan, you would realize how much we love bread. There are so many of fancy bakeries everywhere! This is my first Japanese bread making a video, I don’t know why it took so long. I’ve been teaching baking for more than 15 years. Anyways, I hope my experience will help your bread making! Today, we knead the dough with hands. Whisk the dry ingredients together. Combine water, milk and egg. Mix all the ingredients together and let it sit for 10 minutes. This step makes the kneading process easier when I knead the dough by hands, the gluten relaxes and the flour absorbs the water while resting the dough. After 10 minutes, take the dough onto your working surface. This is how I do. Spread the dough and put together, spread and put together. Repeat until smooth, about 5 to 6 minutes. In this way, gluten develops faster and you can see the dough is evenly kneaded. I don’t smash my dough because it is noisy and not elegant at all. Open your feet back and forth, draw your navel in, use your arm as if pushing from back, relax your shoulders. It’s a good workout for your full body! This is how to check the dough is nicely done. When the dough stretches thin as if you can read the news paper under the dough, the gluten is developed. Now it’s the time to add butter. Spread the dough and add room temperature butter. Wrap it with the dough, and start kneading. The dough will separate first, but it comes together sooner or later. It will take about 2 to 3 The reason why we add butter after is, butter prevents from developing gluten. If the gluten is not developed, the bread would not rise. When the dough comes together and stretches thinly, put it back to the greased bowl. Cover with plastic wrap and let it rise at a warm place ( approx.30℃ 86℉) until doubled in bulk. Meanwhile, let’s prepare the cookie dough. Cream the room temperature butter and add the sugar in three times. It doesn’t seem combine, so take your time to mix together. When it comes together, add egg in three times. Switch to a whisk and mix well. Add rum and mix. 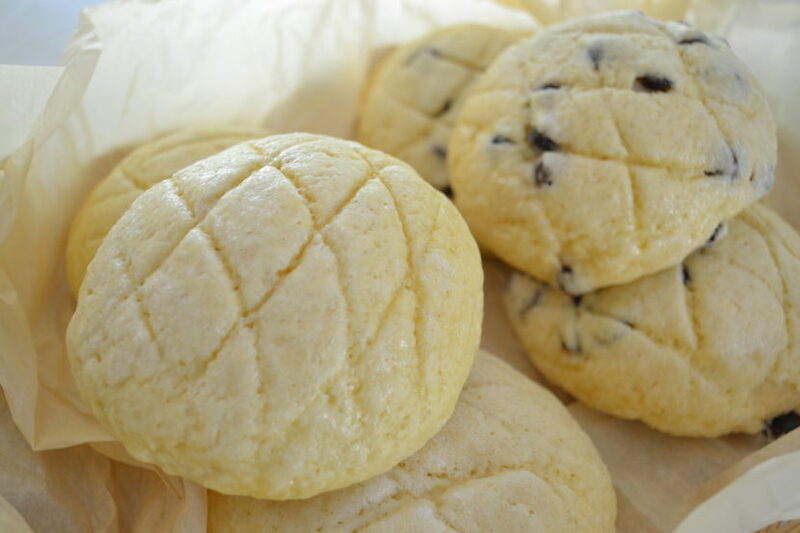 Rum adds beautiful aroma to the melon pan and keeps it moist longer. Add shifted flour and mix to combine. Wrap in a piece of plastic, and chill in the fridge until used. After 45 to 50 minutes, the dough should double in volume. Poke with a flour-dusted finger, and the hole stays as it is, it is good to proceed. Weigh the dough, and divide it into 10 equal portions. I like to cut the dough out and shape into a log. You can easily eyeball it. But , I am a professional and I like it even. I always weigh each dough. Roll into balls and cover with plastic wrap to prevents from drying out. Cut the cookie dough into 10. Shape into ball as we did to bread dough. Put a generous amount of granulated sugar in a small bowl. Set aside. Let’s combine the dough together and shape it into melon pan! 9. Take one cookie dough and flatten it to 6 to 7 cm (2.5 inches) in diameter, slightly bigger than the bread ball. Take one bread dough and re-shape into a ball, put it onto the cookie. Take it onto your palm, and circulate your hand to put them together. The cookie crust would get down underneath the bread dough while rotating. Flip it over and pinch the dough to seal. Place it in a sugar bowl and cover the surface all over. Flip over again and score the surface with criss－cross pattern. Line them on baking tray, cover with damp cheesecloth and let them rise at a warm place (28-30℃　82-86℉) for 30 minutes until double in volume. Preheat your oven to 170℃(325℉) while fermentation. Adding chocolate chip to Melon pan is popular in these days. Here is how it is done. Flatten the cookies dough as we did, place a tablespoon of chocolate chip between the cookie and the bread dough. And the procedure is the same as plain. 10.Pop into the oven and bake for 13 to 15 minutes or until crispy on the outside and smells good. It is said that the “Bread is time” “Confection is temperature” What these mean is keeping the time in the recipe is important in making bread. If your oven is slow and it took longer the recipe indicated, you should set the oven at higher temperature. On the contrary, in making the confectionary, you have to keep the temperature. If it takes longer, it’s OK to keep cooking until you get satisfyng result. Keep the rule in mind and it will be helpful when you don’t know what to do. 11.Smell so good in my kitchen! I love the yeasty smell in the air changing into toasty breadly smell! Breath deep and feel I’m living! When it’s done, take out onto the rack, and let them cool to room temperature. Let me show you how fluffy it is. Sweet but too sweet, outside is airy and crispy. I’d like to have this with a glass of cold milk. Oh, it’s so good. I hope you will give it a try!